I always loved having my kids home from school. I loved spending time with them and thinking of fun things to do. We live in an area that is pretty much hot and humid almost all year around so in the summer it is just hotter than usual. We have had to come up with some pretty creative ways to stay cool because we do not have a built in swimming pool at our house. We did purchase an above the ground pool which all the kids had a great time in. Along with the pool we would play in the sprinkler and play games with water balloons. The kids used to like to play a form of baseball with the water balloons, one would pitch and one would bat and both would end up getting wet if they made a hit! That was the fun of it. Or the water balloon toss where you toss it back and forth moving farther and farther apart until someone misses and get soaked or it breaks in their hands. Water guns are another way to play with water and have some fun. The bigger the better and the more they got wet. When it gets hot these are great ways to have a good time. Just make sure you have a lot of towels on hand; with a warm bath afterwards you should have children ready to sleep! Most kids love to camp and this is another great summer activity depending on where you live of course. In our neck of the woods it is often too hot to camp in the summer so we usually camp in the spring or fall here. If you live in more moderate climates that get cool at night or in the evenings then camping is ideal. Especially if you camp near a lake where you can drop a line and catch a fish or jump in the cool lake for a swim. Hiking, biking, eating out of doors, and seeing all kinds of wildlife up close can be a blast for children. It can be a real treat for kids that are used to the city life but roasting marshmallows over a campfire or making smores is fun for all. Taking full on vacations can be fun but for those of us who cannot take long vacations day trips can be a great time for the whole family. My mom used to babysit my kids while I worked and would often take the kids on a day trip to places within an hour or two of home every week. They would visit museums, the zoo, water falls, lakes, and do things like fish, rock climb, hike, bird watch, pick wild berries, and on and on. Most of us live within a couple hours of interesting activities and we do not even know it. There are no mountains per se in our area but there are several nice hilly locations. My children loved to go and climb these hills and for younger children it can seem like a mountain climb and they get a big kick out of it! The zoo in our area has a water feature that the kids can run through to stay cool along with a manmade lake with paddle boats and a small train. Browse the internet to find neat things to do within a couple hours of your home and you will be surprised. Kids even like going to farmer’s markets, and often they have ranches or farms open to the public to pet animals, milk a cow, pick your own fruits and vegetables, and maybe even ride a horse. Take advantage of all the interesting places that are nearby, you may be surprised at what you are missing by traveling great distances for vacations when you have all these things to do so close to home! Another fun activity that we do in our family is to have family bike rides to the park and we would take along a picnic as well. The kids loved riding bikes as a family and ending up at the local park to play and eat. If you do not have a local park then you can find a nice park within driving distance and plan a picnic meal with your family. This is a wonderful way to spend time as a family. Take along a football, baseball equipment, Frisbees, or fishing poles if the park has a lake. There are some really nice parks around the cities and all the state parks (which there are many) allow you to come in for the day for a small fee and use their tables, playground equipment, and have access to the lakes as well. Most of them are covered in trees for plenty of shade and you can take along chairs and blankets so that you can sit and chat or even lie down for a nap. We have often camped or spent the day at one of our state campgrounds and they are all very well maintained and a very safe place for a family gathering. One summer we camped near a lake where you could rent a fishing boat and we taught the kids to paddle the boat (which is no easy feat). They had a great time out in the boat; of course they had on life preservers, and loved fishing from the boat as well. You can sometimes catch much bigger fish boating into the center of the lake than you can from the shore. This is a real treat for kids that are not raised near a body of water. We ended up catching turtles instead of fish sometimes but it adds excitement when something unexpected shows up on the end of the line. It is especially exciting for us as parents! Going to the neighborhood pool or a water park is another fun way to spend a hot summers day. 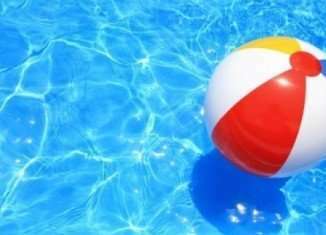 Depending on the rules of the pool or park you can sometimes take a cooler of drinks and food with you and have a picnic but often they require you to purchase their food and drinks. We found one that we like that lets us bring in our own which is way more economical and everyone can get a drink or eat at their leisure. But usually I have to round my kiddos up and get them to eat and drink because they are having too much fun to take a break. You have to be careful to make sure they are hydrated and protected with extra sun screen from time to time to prevent anyone getting burnt or sick. We live in an area where there are rivers that they allow you to ride inner tubes on. It mostly a nice gentle ride and we tie our tubes together so that no one gets too far away. From time to time you come upon a little waterfall of sorts that pushes you along faster all depending on the rainfall that we had that year. You want to be sure if you go somewhere like this that the water is high enough because you can bottom out as well and it is not a lot of fun to walk your way down river! The people you rent the tubes from have a place at the end of the river to turn in your tubes and get a ride back to your cars. The children loved doing this and it makes for a nice, cool day. You can rent a tube for your cooler as well and have it floating along besides you! Some of these things do depend on what part of the country you live in but in every part of this great country of ours there are sights to be seen and things to be experienced if you do a little research. Many times we wait for our vacations and plan big events to have all our fun in a two week period of time but there are so many fun activities that you can find to do close to home. You can find something fun to do every week with your kids if you get creative and do a little research. You will probably be surprised at all the activities you can find where you live!